In this article series, I show you how we help our clients to improve velocity: the time from idea to production. For this post, we'll go over the ins and outs of EC2 based app infrastructure. The overall architecture will consist of a load balancer, forwarding requests to multiple EC2 instances, distributed among different availability zones (data centers). Let’s start simple and tackle all the challenges along the way. A single EC2 instance is a single point of failure. When you want to run a production ready app on EC2, you need more than one EC2 instance. Luckily, AWS provides a way to manage multiple EC2 instances: the Auto Scaling Group. But if you run multiple EC2 instances to serve your application, you also need a load balancer to distribute the requests to one of the EC2 instances. In the Local development environment part of this series, you created an infrastructure folder which is empty by now. It’s time to change this. You will now create a CloudFormation template that describes the infrastructure that is needed to run the app on EC2 instances. Let’s recap what you implemented: A load balancer with a firewall rule that allows traffic on port 80. In the case of 5XX status codes you will receive an Email. But the load balancer alone is not enough. Now it’s time to add the EC2 instances. # A bastion host increases the security of your system. In this case, we use one of our Free Templates for AWS CloudFormation (https://github.com/widdix/aws-cf-templates/tree/master/vpc). # Where does this AMI comes from? It will be created in the CI/CD pipeline! # How long do you want to keep logs? # The app listens on port 3000, but only the load balancer is allowed to send traffic to that port! # Log files that reside on EC2 instances must be avoided because instances come and go depending on load. CloudWatch Logs provides a centralized way to store and search logs. # The EC2 instance needs permissions to make requests to the CloudWatch Logs service to deliver logs. 'AWS::CloudFormation::Init': # Configuration for the cfn-ini helper script that runs on startup. This is only needed for the dynamic configuration. The rest is backed into the AMI in the CI/CD pipeline. Let’s recap what you implemented: The Launch Configuration defines what kind of EC2 instances the Auto Scaling Group creates. 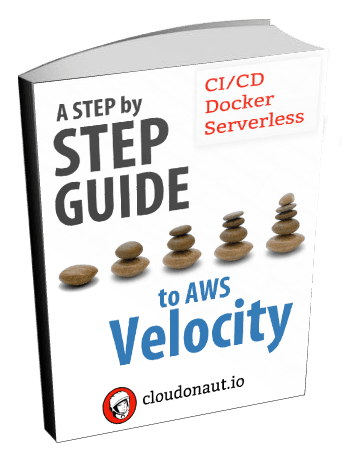 The cfn-init script reads Metadata from CloudFormation to configure an running EC2 instance dynamically. The cfn-signal script reports to CloudFormation if the EC2 instance was started successfully or not. CloudWatch Logs stored the log files that are delivered by an agent that runs on the EC2 instance. # Increase the number of instances by 25% but at least by one not more often than every 10 minutes. # Decrease the number of instances by 25% but at least by one one not more often than every 15 minutes. Let’s recap what you implemented: The Scaling Policy defines what happens when you want to scale while a CloudWatch Alarm triggers the Scaling Policy based on live metrics like CPUUtilization. The Auto Scaling Group will now keep a dynamic number of EC2 instances but always ensures that not less that two instances are running and not more than 4. The infrastructure is ready now. Read the next part of the series to learn how to setup the CI/CD pipeline to deploy the EC2 based app. Learn more about AWS with our book Amazon Web Services in Action.